All subs are topped with your choice of tomato, pickle, onion, salt, pepper, oil and oregano, mayo and/or mustard on request. Local pastrami cooked in Santoro’s special sauce. Thinly sliced steak, sautéed peppers and garlic. Italian all beef meatballs in our homemade sauce. Local mild all pork Italian sausage in our homemade sauce. Made with the best local deli roast beef. Mortadella and bologna with Wisconsin provolone. 98% fat free ham and Wisconsin provolone. Molinari, Italian salami, cappicola and Wisconsin provolone. Browned roasted deli turkey breast. 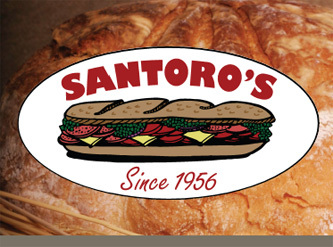 Santoro’s own special blend tuna salad sub. All white meat chicken salad sub. Large Italian pepperoni and Wisconsin provolone. 98% fat free ham and premier deli turkey.